Mineral bath structure, village of Zhelyaznitsa, vicinity of Sofia, Bulgaria, 2016. Fuji X100 with +1.4x tele-converter. Click on image to enlarge. Further to “Past Glory,” a weblog entry from 2014, the photos above and below show the present states of two mineral bath structures in the vicinity of Sofia, Bulgaria. 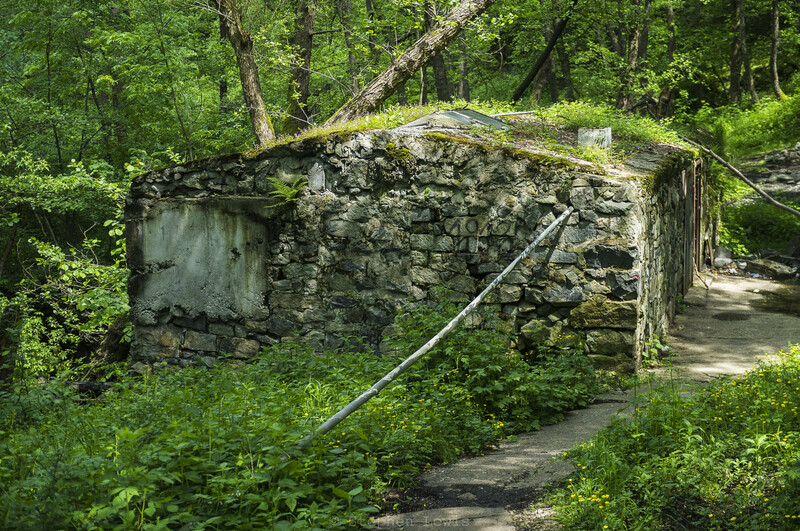 A rough-hewn stone structure set at a hillside mineral water source a few kilometers outside of the village of Zhelyaznitsa at the foot of Mt. Vitosha, not far from the Bulgarian capital, Sofia. The structure contains two bath chambers, one derelict and the second functioning. In an unabashedly Balkan manner, the functioning chamber remains the province of men; the derelict chamber, in principle, is reserved for women. The ornate former entranceway to the abandoned bathing pavilion at Gorna Banya, a one-time spa resort just outside of Sofia. Today, Gorna Banya is a quiet residential village but in the first decades of the 20th-century, it was sufficiently popular as a resort and suburban residential locale to merit being the terminus of one of Sofia’s first electric trolley-bus routes. In the early years of the last century, Gorna Banya had the added panache of being the site of Bulgaria’s military cavalry school and later, less romantically, of an armored tank battalion. As to the style of the entranceway, if the decision was left to me, I’d label it “Balkan-Neo-Secessionist-Neo-Ottoman” — a combination of the characteristic styles of two vanished empires but built of a Balkan provincial mix of brick, plaster, and ceramic roof tiles. Any other suggestions as to stylistic labels, or any information about the history and prospects of the bath pavilion and its surroundings, are most welcome. While the bath pavilion molders, a couple of hundred meters away from it, on the other side of the village green, a nondescript commercial structure is being converted into an impromptu gambling casino, a usage, it seems, still in accord with the developmental ethos and preferences of Sofia’s private sector and decision-makers . Former entranceway, abandoned mineral bath pavilion, village of Gorna Banya, outskirts of Sofia, Bulgaria. 2016. Canon G10. Click on image to enlarge. Many thanks. I’d forgotten about the wonderful postcard collection on stara-sofia.com. Based on a few of the cards and on your note that it was Sofia’s first electric trolley and not tramway that ran to Gorna Banya, I’ve made a few small corrections to the text. 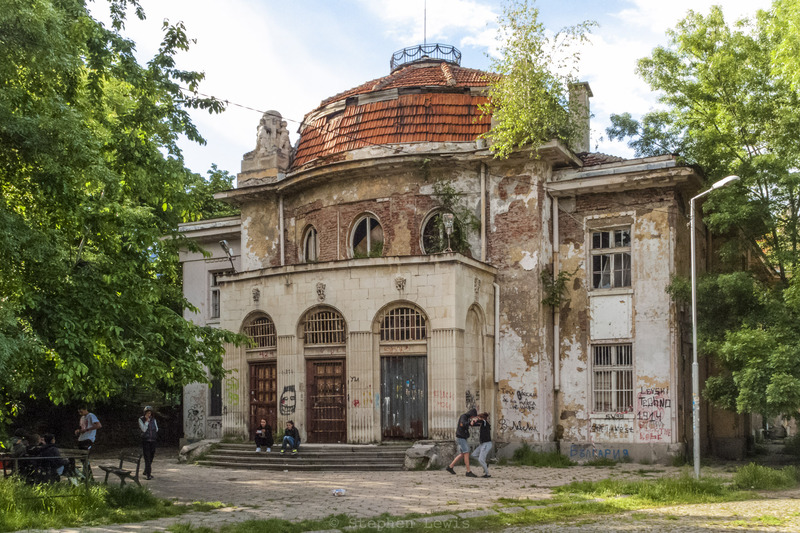 It’s such a shame that Sofia’s Central Bath was left to molder for so long and that even now it has not been restored to its former glory for its original purpose. Tastes change and municipal hygiene has improved. Thus, despite your and my preference for the restoration of the Central to its original purpose, time marches on, so to speak. The conversion of the structure to the Sofia Municipal Museum, however embodies a couple of quite Balkan ironies. First, as a crusty Bulgarian academic of a certain age commented to me: “A museum, at a site and within a structure characterized by excessively high humidity? Bravo!” Second, the collection displayed in Museum devotes disproportionate attention to the persons and courts of the Tsars who, after a fashion, ruled Bulgaria from the 1880s to the 1940s; the Museum’s attention to Sofia itself appears to take second place. In a future blog entry I hope to post one of more photos of the beautiful and seemingly restored facade of the Central Bath.